Kenton K. Shimozaki Tim Devin speaks to a crowd of over 60 people who have gathered for the counterculture walking tour of Inman Square. 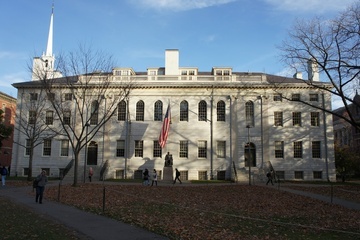 Inman Square lies at the junction of Cambridge, Hampshire, and Inman Streets, several blocks west of Harvard’s campus. As the counterculture movement picked up steam in the 1970s, many organizations based in Inman played important roles in advancing progressive causes. Tim Devin is a technology librarian at the Somerville Public Library—at least for his day job. In his spare time, Devin researches and speaks about Cambridge’s historic counterculture movement. 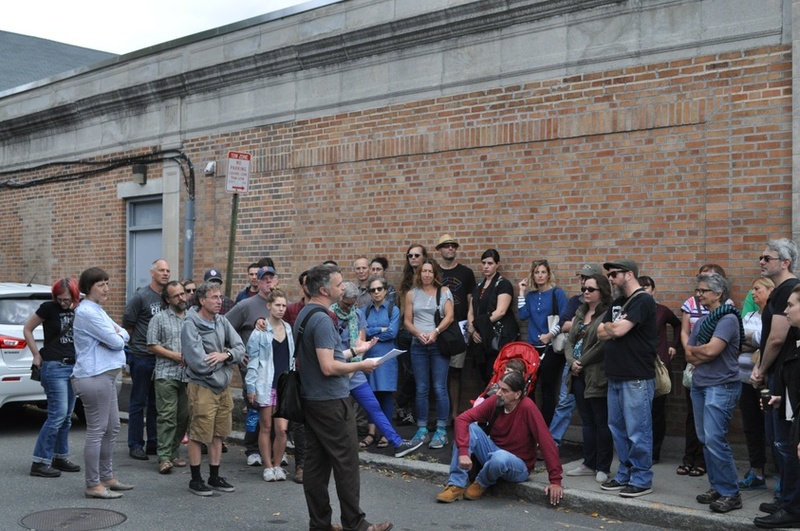 Devin also leads a walking tour of Inman Square based on his recently published book, “Mapping Out Utopia: 1970s Boston Area Counterculture.” The 80-page volume describes over 100 places of note to the countercultural movement. Replete with illustrations and hand-drawn maps, the guide takes readers through an array of sites in Inman, Central, and Harvard Squares. At noon on Saturday, a crowd of over 60 people gather outside Practice Space, a storefront design studio on Cambridge Street in Inman, awaiting the start of Devin’s tour. First stop: 186 Hampshire Street. “Two generations of owners have rented it out below market value to progressive groups,” Devin says. That kind of practice helped progressive organizations thrive in the square at the time. One notable occupant of 186 was the Boston Feminist Credit Union: Devin says the square was a “focal point” of feminism in the ‘70s. Today, he says, the building is valued at at $1.2 million. As Devin speaks to the crowd, his three-year-old son teeters on a parking stop, holding his father’s hand and smiling. It’s important to Devin that his walking tour is kid-friendly, and he says he tries to welcome families with young children to all his events. He says that culture—where inclusion of young children is frowned upon—limits the types of adults that are able to attend progressive-oriented or activist-type events. At the tour’s second stop, Devin turns the speaking over to Greg W. Hill, a community member who was involved with Trout Fishing in America and the People’s Gallery, two organizations which occupied 188 Broadway St. in the ‘70s. Hill says that Trout Fishing in America—named after a novel written by Richard Brautigan—was an “alternative school” where locals gathered to teach free classes during the countercultural era. The school helped pave the way for a “People’s Gallery,” which leased space in the building with an environmental group called Ecology Action. While some groups moved in, and some collapsed, the organizations all became linked by cooperative use of the space. Now, the building that was once home to an alternative school and photo cooperative society contains a set of quiet condos. Condo units sell for over $1 million each, according to Devin. He cites the rising cost of housing in Cambridge and the lack of affordable spaces devoted to art and progressive causes as a concern for him and an impetus for his tour. Thinking about the current political moment and the legacy of Cambridge during the counterculture movement, Devin says that it is “inspiring” how organizations came together and advocated for change.